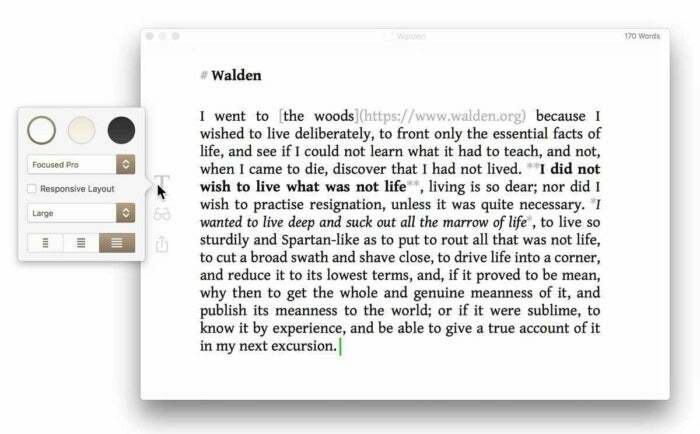 Formerally known as Typed, does this Mac writing app have what it takes to stand out from the crowd? There are lots of “focused writing” text editors available for Mac. A couple of years ago, I reviewed a number of these tools, and chose which I thought were the best. One such app that wasn’t around at the time is the aptly named Focused ($36). This app started out as Typed, from Realmac, and was acquired this year by Codebots, who changed its name. There’s a standard feature set for this type of minimal text editor. They all offer a distraction-free environment, full-screen mode, and generally offer support for Markdown. Many also offer document statistics, and all offer a number of export formats, including HTML. Some even go further to try to help you be creative when you write. Focused has all of the above, with an attractive display offering three themes: the default black on white, a night theme, and a sepia theme. Like many of these apps, it only offers a limited number of fonts; there are six choices, which include serif, sans serif, and monospace fonts. Some text editors only display the special characters used for Markdown, such as * and #, but some also show how these characters format text. For example, Focused shows you when you’ve made text bold or italic by display the text within these control characters in that format. It also bolds headers, and dims links, so they don’t stand out. Here’s an example of how Focused displays formatting using Markdown. Focused offers a full set of keyboard shortcuts for applying Markdown formatting, so you can quickly apply bold, italic, and headers, and add links and images. It also has a nifty popover menu, which lets you choose a font, theme, and some other settings, that displays when you hover over the left side of a document, as you can see above. 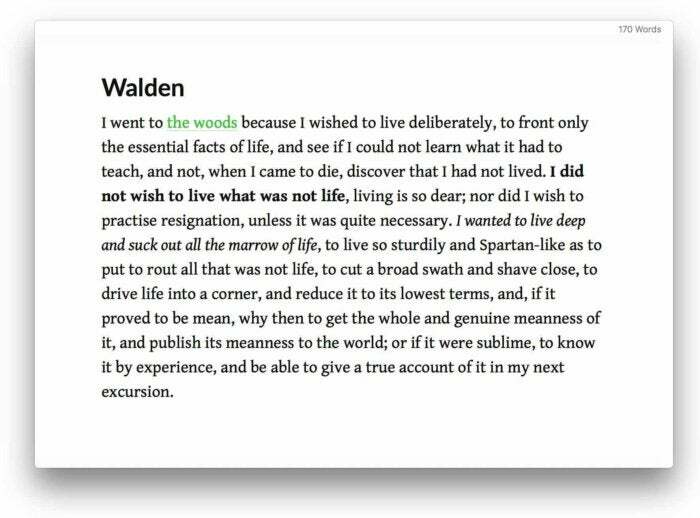 Focused also lets you preview how your text looks without the Markdown formatting characters. From the popover menu in the screenshot above, click the eyeglasses icon. You can quickly switch back and forth between editing and preview mode using that icon, or using a keyboard shortcut, so you can always see what your final document will look like, but you can’t edit text in preview mode. What sets Focused apart is what’s called “Zen mode.” When you enter Zen mode, the app goes full screen and starts playing a soundtrack. These are mellow, ambient soundtracks, with slow guitar (or is it koto?) music, or with bells, or atmospheric sounds like rainfall or wind. You can choose which soundtrack you want to hear from the app’s preferences. I can imagine this Zen mode may interest many users, but if you already have similar music to listen to, you may not want to use it. Nevertheless, it could be a nice way to, well, focus for a while, when you’ve been working on something for a long time. I found a few bugs in Focused. The inline Markdown formatting doesn’t work with Helevetica Neue, and the app’s undo feature is a bit wonky. If I apply, say, bold to some text, then press Command-Z to undo that operation, the bold remains, and the app undoes the last text I typed. If I select the bold text and press Command-B again (which should un-bold it) it just adds more asterisks around the text, rather than removing the bold formatting. The developer said that he was going to get these fixed as soon as possible. With the stiff competition among text editors, Focused has a bit of difficulty standing out. If you like the idea of Zen mode, then this could be a good tool for you. And its sepia theme is quite attractive, if you want something between the standard look and night mode. But other tools have a richer feature set, at a lower price, so it’s worth comparing what’s available if you’re looking for a simple text editor of this type.